Confession time: I still don’t fully understand how to use Instagram. There’s an unwritten protocol of use and luckily I don’t have kids who use it, otherwise I’d have no idea how to monitor their activity. It was enough of a learning curve trying to figure out our iPad Restrictions so that my sneaky kiddos didn’t find workarounds – I can’t imagine how much more hair I’d lose if I knew my kids were active on photo-sharing and live-streaming apps. The newest crop of share-everything-about-your-life apps available for the iPad include the wildly popular Periscope, and the less talked about but still potentially kid-unfriendly apps Meerkat and YouNow. These apps allow users to video stream in real time, and watchers can comment without content filters. Sure, used within the right context these apps can be very cool for the right audience. In fact, the kids and I recently watched an important press conference about a train crash before the TV news channels could realize it was happening. But there’s also a dark side to this innovative way to share: Pornographers and predators are using the apps to broadcast adult content, and unless you just don’t allow your kids to use the apps, there’s really no workaround to avoid this. All three apps are theoretically in their infancy and haven’t yet worked out the kinks to appeal to a more family-friendly audience. 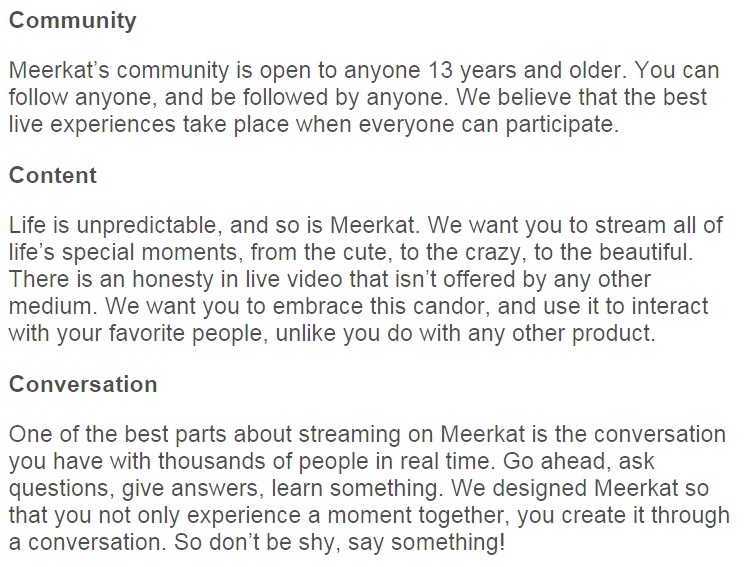 I want to say they tried: both Periscope and Meerkat have community guidelines (not rules) that condemn adult content, and both apps offer up a warning about use for children under the age of 13. (Periscope actually offers users a lengthy outline of acceptable use behavior.) Still, by the time kids can open the app and check out a live feed of adult stuff it’s already too late, and while reporting violators may help in the future, it won’t undo what Little Jimmy has already seen. Bottom line? 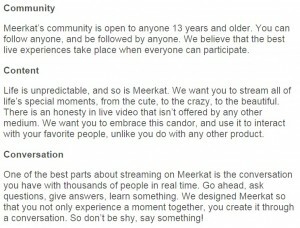 Periscope, Meerkat, and YouNow do not seem to be apps for kids, period. If you want to enjoy using the apps, try sharing it WITH your kids to help manually filter out unsafe content.